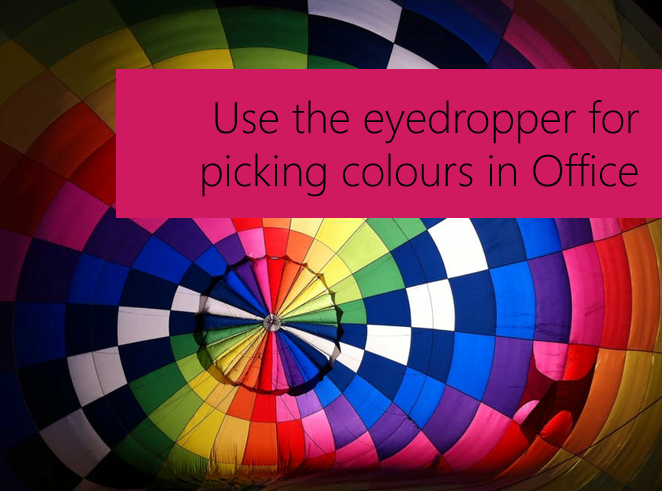 #Microsoft365 – Ever tried to match a colour in a PowerPoint presentation, hours later, you’re happy it’s exactly the same, only to print or present it and it looks completely different? Today we’ll match colours to build a beautiful presentation. Now I’ll insert a couple of shapes, on which I’ll add the font for my Index slide. Once you’ve inserted the shapes, select the shape (1), click on the “Format” Tab (2) > “Shape Fill (3) > “Eyedropper (4). Now you can click anywhere on the photo (5) and the shape will pick up the colour you have selected. I’ve inserted one of my favourite photos into a PowerPoint presentation. I would like to build a presentation, using the same colours to style any shapes, pages and fonts I use. If you need to make the photo smaller or larger and you’re not sure how – read my post on aspect ratio. If necessary, remove the outlines to your shape (as their colour will be different). Select the shape (1), click on the “Format” Tab (2) > “Shape Outline (3) > “No Outline (4). Everyone has the ability to be creative, sometimes it just takes someone to show you how. Till tomorrow.